How do you get a 2-year old and a slightly-reformed veggie hater to eat leafy greens? You add pasta. But grate some of those objectionable vegetables into small pieces and mix that scrunchy face-inducing green with pasta, a little cheese, and just a little meat to accent the dish (there are few meatless meals wouldn’t cause a revolt in this house) and you’ve got a healthy pasta dish that’s a winner among veggie lovers and haters a like. And my favorite bite is that first one, the one loaded with the top layer of slightly crispy pasta and cheese. Image used with permissionUpdate: The winner is Emily B with comment #46! And for the giveaway: it’s a 4-piece set of Microplane graters from BigKitchen.com! 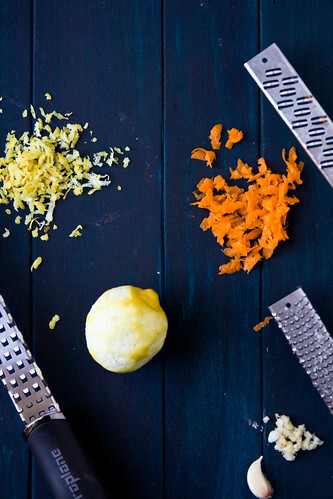 A great set of high-quality tools to use for any recipe that requires you to shred, zest, grate, or mince ingredients. To enter, head over to The Big Kitchen Store to see what they have to offer and then share with us in the comments: What kitchen tool is at the top of your must-buy list? – Leaving an additional comment that you like Big Kitchen on Facebook. – Leaving an additional comment that you follow Big Kitchen on Twitter. – Giveaway ends at 11:59pm (Texas time!) on 1/14. – Winner will be selected by one of those cold, soulless, unfeeling random number generators and announced on this post on 1/15. – Winner will receive a 4-piece Microplane grater set directly from BigKitchen.com (maximum total retail value of prize $50). – Prize must be claimed within 7 days or it will be forfeited and an alternate winner selected. – Prize can only be shipped to a US address. – Official giveaway rules can be found here. In addition to the giveaway, if you find something you like at the Big Kitchen Store, they have offered a 10% discount on all orders through 1/31/12! Simply use the promo code FOODIEBRIDE when you check out! Kale transforms this pasta dish into a healthy one-bowl dinner. Drain the pasts and return it to the pot pot. In a large skillet, heat olive oil over medium-high. Add onion and red bell pepper, cooking until softened (~5 minutes). Add grated carrot and garlic, cooking another 2 minutes. Add kale, toss, and cover, turning off the heat and letting sit for 5 minutes. Transfer to the pot with pasta. Stir in ricotta, lemon zest and juice, hot sauce, 1/2 cup Parmesan, and chicken. Season generously with salt and pepper. Transfer mixture to a 13x9 or large dish. Top with remaining Parmesan. Bake until bubbly and the top golden brown, 30 minutes. Note: I used Dreamfield penne and calculated the nutritional info based on such. If you use a different pasta, your mileage will vary. This giveaway is sponsored by BigKitchen.com. I’ve been dying for a silpat, although there are many things I could use! Although not very exciting, I need to buy a new candy thermometer, maybe something like the TAYLOR TRUTEMP CANDY & DEEP FRY DIAL THERMOMETER. I noticed my old one acting up over the holidays and nearly lost of few batches of toffee as a result. However, after browsing through their site I wouldn’t mind one of those cool digital thermometers either! That recipe looks amazing! and I think I definitely need a 14-cup Cuisinart food processor from the Big Kitchen Store! I like Big Kitchen Store on FB! Top of my list is a nice colander and an immerssion blender! I’ve been on a pineapple kick recently so a pineapple corer/slicer would be helpful. Yum! My top “to-buy” kitchen tool is a big cookie scoop. Seems weird, but I keep forgetting to buy one! KitchenAid Stand Mixer, off-set spatula. So many wonderful options. I think I would buy some new soup crocks, graters and a new thermometer. We got quite a few tools off our must-buy list for Christmas, but we still don’t have a box grater! I need a waffle maker…yes, I NEED one!!!!! I must have a food processor!!! I recently started reading your blog, which I found through Annie’s Eats. This recipe and picture make my mouth water. I cannot wait to try it. Thank you for the kitchen inspiration. I still don’t have a food processor… ack! I would like to have a potato ricer. I really need a big item…a dutch oven! i would love to have the krups grill and panini press. I looked at their site and they have a cute pink Silicone and Stainless Steel Mixing Spoon. I only have one spatula and this one looks nice! I really need new mixing bowls!! I just can’t seem to find the right ones for me! no contest: a food processor. i’m dying for one but they’re so expensive! PS- Shawda, your photos have gotten… IN.SANE. (and I mean that in a really good way!) – They are STUNNING! I think I finally need to get a Silpat. We put the cooktop on the island in our new home, and we’re realizing there’s no place to put a recipe. Our most-wanted item at the moment is a cookbook stand! actually, right now i really need a microplane (or 4) because mine broke! sad day 🙁 but i’d also love more silpats from big kitchen. p.s. i love the crispy bites of pasta too! husband thinks they’re gross=more for me! I have been dying to get a KitchenAid Stand mixer. They are amazing!!! I could really use a new kitchen scale. Mine is no longer reliable. I like the Soehnle White Ultra 2 Digital Kitchen Scale. Or I could also really use a REALLY good candy thermometer. Does anyone have one they love and could recommend? I need some more storage bowls. I would love to own a juicer! I need a new veggie peeler. The one I have now is awful. i could use a food processor or some new small kitchen gadgets. I was just zesting blood oranges the other day with a crappy grater and was thinking how badly I need a real microplane. So that’s #1 on my kitchen wish list right now! I really want a mandolin! At the top of my list is actually a microplane! I REALLY want a food processor! I’ve been really wanting a mandoline. This giveaway also comes just as my beloved microplane zester broke, so I’ve been wanting another one of those! Um, this is kind of embarrassing, but I need a garlic press. It has remained at the top of my must-have list for about 2 years. And in those 2 years I have bought many things. None of them were a garlic press. Mystery. I should probably get an immersion blender! I would love a silpat, or one of those small food processors for chopping small things! I really need a new immersion blender. Mine is on it’s last leg. This recipe looks amazing. I love my microplane grater & use it for zesting citrus and grating cheeses. I would love to get a mandoline or a variety of whisks from the Big Kitchen store. my dream appliance is the kitchenaid stand mixer, but after making key lime meringue cupcakes yesterday by grating limes with a box grater, i know i need a microplane too!! I’d love a spice grinder. The Cuisinart Electric Griddle looks like fun. I’m obsessed with my Ninja food processor! I must by a KitchenAid mixer though! 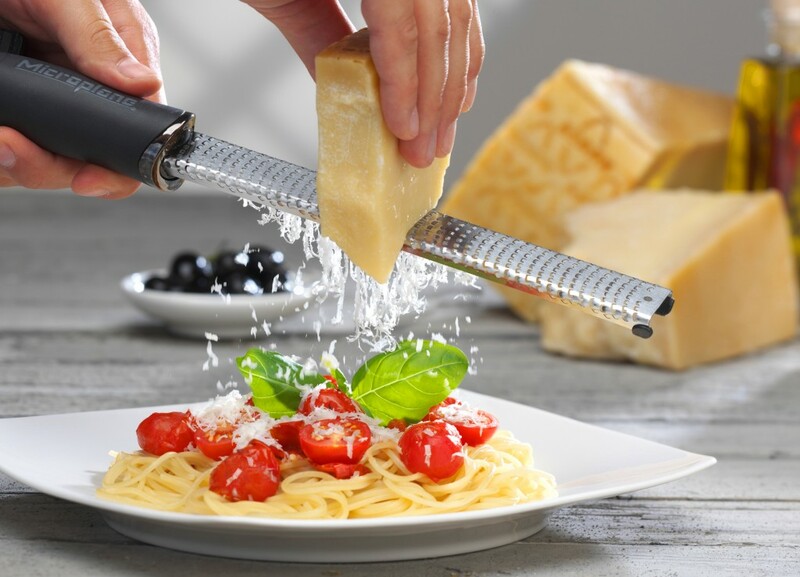 I would love a Silpat liner, but a Microplane grater is also at the top of my gadget list! I am almost desparate for a Silpat — I oogle them everytime I see them! So I finally got a Kitchen-Aid mixer for Christmas (yay!!) so the next thing on my “must buy” list is a new food processor! the new kitchenaid! I want one so badly! I drool over waffle makers, Silpats and Microplane zesters! I’m a fan of Big Kitchen on FB! I could use a good pastry brush, or a new rolling pin, or a jelly roll pan. ooh i would love a microplane! 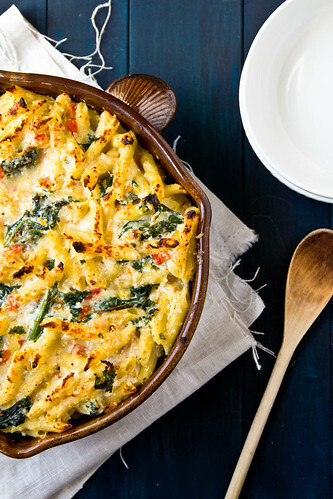 this dish reminds me of a similar baked pasta in cooking light that I’ve been dying to try! yum! I really want the ‘spatula blade’ for my kitchenaid mixer. I liked Big Kitchen on FB. A pasta strainer, haha! I still don’t have one. I’ve been eyeing a mandolin slicer for quite some time now. A kitchenaid mixer is on the top of my list! A microplane, believe it or not, and a kitchen scale! I follow @bigkitchenstore on twitter! This looks great. I love baked pastas. I find that my toddler will be willing to eat veggies if it is in soup form. Yesterday he was gobbling up all the onion, celery and carrots in my chicken soup, but find a tiny piece of onion or garlic in my bolognese and the party is over! “I no like that!” Off the subject of toddlers-a food processor would be nice! I would love a cast iron skillet! I’d like to try a silpat…and these microplanes! I liked BigKitchen on facebook. Also now following@BigKitchen on twitter. Beater blade for my Kitchenaid stand mixer…love the glass bowl too! i would love to have their ZYLISS 4-IN-1 SLICER AND GATER – wow! I would love to own a food chopper (like a “slap chop”, haha) because I hate dicing things! But in lieu of that, I think one of the most important tools you can have are good knives! And of course take care of them well too. On the top of my list would have to be a full-sized Bosh mixer. A Dutch oven is at the top of the list. Kind of boring, but I really need a metal colander. The one I have right now is plastic and nasty! I really need a juicer! Follow Big Kitchen on Twitter! I am in need of a heavy duty pair of kitchen shears. A great set of knives… Recipe looks/ sounds yummy…! I would love the Revol Grand Classiques 6oz ramekins, set of 6! It would have to be the kitchenaid food processor. Mine is on it’s last leg and I use it all the time! My next kitchen gadget will be the Keurig brewer. I’m tired of the “coffee” my office brews. I really want the meat ginder attachment for my kitchen aid. I need a new pizza peel! This looks fantastic!!! I love kale! Do you have any other creative kale recipes?? I need a new mandolin. I love their stainless steel measuring scoops- instead of regular measuring cups! Thought I could use a Microplane grater!! Pasta maker attachment for my KitchenAid. I really need a candy thermometer!! You NEVER need to convince me to eat my veggies. But you also never need to convince me to eat pasta either. Great dish! So.. I use a grater for zesting? I could use one of the microplanes! I would love a Le Creuset french oven, in cherry or cobalt 🙂 I’m sure one will end up on our wedding registry, but with a year and a half to go, it’s going to be difficult to resist buying one myself first! I have been wanting a new box grater with storage. Honestly, I’m looking for a microplane grater, or a mandolin. And this recipe looks great, can’t wait to try it. I would love to get a waffle maker!! There are so many things I want or need in the kitchen. One tool would be an immersion blender. I feel like I’d be a lot more motivated to make soups (since the warm weather isn’t keeping me inside lately). 😉 Not that I’m complaining..
I’m looking for a new hand mixer- our old one died while mixing a batch of cookie dough! I really need a microplane grater or cookie scoop. Both things that have been on my list forever, but I just haven’t gotten around to buying. I really want new salt and pepper mills. I would love a Vitamix blender but I will have to wait until my Kitchenaid Blender dies. The plastic has started to crack. I have started to make smoothies and when I add ice it just doesn’t do a great job. A microplane grater was on my Christmas list and somehow Santa forgot it! 🙂 So, that is still at the top of my wishlist! I’d love to get a grain mill! I follow Big Kitchen on facebook (Rust Hawk). I would love a serrated bread knife. The Miracle Blade III that my brother gave me ages ago just doesn’t cut it (har har). Wow, my list is long! Guess I would have to go with the big item at the top of my list, which I saw on their web site, a Cuisinart food processor. Following Big Kitchen on Twitter! I want a donut pan!! Are parchment rounds a tool? Or the Red Staub cast iron dutch oven?? Um, I never knew about this store, and I can’t decide if I feel elated, or doomed! It’s pretty much awesome! Thanks for the intro! This looks so good! And will save me from buying/watching decay/throwing out bag after bag of kale. Also, just the sight of freshly grated Parmesan makes me hungry. I am in dire need of a silpat and of course a microplane set! The extra-large granite stone mortal and pestle. I have a molcajete, but would like this for finer grinding, like seeds and spices, or for hand-made pesto. I am in need of a fruit and vegetable wedger. And a microplane set would be a great addition also! I’ve been pining for a mandoline for a while…maybe it’s not totally necessary but it sounds like it would make my life a whole lot easier! I would LOVE a bench scraper, bowl scraper, and a cloth piping bag and coupler! ( I have the tips) Thanks! I would love to get these graters, and another thing I have on my list is a popover pan! I would love to get this: Emerilware White Programmable Baguette and Bread Maker. My old breadmaker has served faithfully for many years but is getting old. I’d have to say a mandolin and a juicer. silpat mats, I have lust in my heart! I’d love to own a mandoline, and these graters, too! I’d really like to get an mandoline cutter. Santa just didn’t come through this time! I am saving up for a kitchenaid stand mixer! I have been into the idea of mastering tarts so I would want the FRIELING ZENKER NON-STICK 11 INCH TART PAN. I would love a spice grinder! I need new knives so badly! I keep sharpening my old knives but a really good, new knife is on my list! I can really use one of these in my kitchen! Following Big Kitchen on Facebook! Following Big Kitchen on on Twitter! My baster died recently, may it rest in peace. And I recently selected a new (*much* fancier) one, which The Big Kitchen just happens to carry: the Tovolo Polycarbonate Dripless Bulb Turkey Baster. I really need a pizza cutter and an immersion blender! I follow Big Kitchen on facebook. 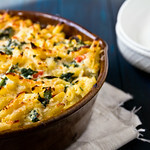 This penne bake is amazing and I’ve been inspired to feature it in my Friday Food Fetish roundup. And I’ll be sharing on Pinterest. Please let me know if you have any objections and KEEP IT COMING! I think a mandolin is next on my list of kitchen things to buy. I’m following Big Kitchen on Twitter too! I’ve really been wanting to buy a dough whisk! I need a new batch of spatulas and spoons! I could use a new saute pan with a lid… the non-stick coating on mine is JUST ABOUT gone! Otherwise a larger food processor would be nice… the little tiny one just isn’t getting the job done anymore. I really need an immersion blender, and I can’t figure out why I don’t have one!! I like BigbKitchen on fb! Without a doubt, the top thing to have is a really good (and well-balanced) santoku knife! At the top of my list is an immersion blender! Wow, we don’t have one of these and need one! Right now I have a very real need for spice storage so I’d love something like the Prodyne 12 Bottle Acrylic Spice Tower CarouselBottle. 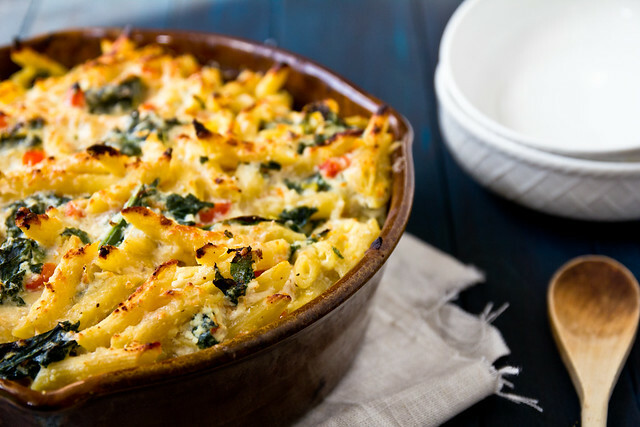 i super duper love that you are adding weight watchers points to some of your recipes. brilliant. and this looks so yummy! Would this recipe freeze/thaw well? I’m never too crazy about thawed pasta – lasagna is an exception. But other pastas seem to get dry. I’m cooking the baked penne with chicken and kale. I wonder if the quantities of the pasta and the ricotta are correct?! Seems an excessive amount of ricotta for this amount of pasta? Could you please put the metric quantities in brackets with the recipe? Much appreciated. I’m still going to cook the penne but adjust as I see fit. I’m sure it will still taste great. Thanks for the recipe! I’m experimenting with kale as the season for this veg has started here in the Netherlands. I just made this and there is no way I could have used 48oz Ricotta Cheese. I used 28oz. Is that what you meant?